This recipe cost calculator will help you to quickly and easily break down bulk food purchase costs into portion costs. You can either use the calculator for individual portion costing (say a 5-ounce portion of French fries), or you can use the calculator to cost a complete recipe or a menu item. Plus, you can even enter the menu price and the calculator will calculate the food cost percentage for you! Food cost percentage formula tutorial. Calculate food costs for pricing portions and menu items. If you are costing a menu item that has more than one ingredient, complete this top section. Otherwise, if you are just costing a single ingredient you can leave this section blank. If you are costing a menu item having more than one ingredient, and you would like the menu item name included in the food cost summary, enter it on this line. If you would like the restaurant food cost calculator to calculate the food cost percentage of a menu item having more than one ingredient, enter the menu price on this line. If you have a target food cost percentage in mind, enter it here and the calculator will calculate the price you would need to charge for the menu item in order to achieve your target food cost percentage. Enter as a percentage but without the percent sign (for .25 or 25%, enter 25). Important: Depending on the width of the calculator, a different entry form will be displayed along with a different set of instructions. Narrow widths will display a mobile-optimized form, whereas wider widths will display a desktop optimized form. Enter the description, costs and quantities of an ingredient of the menu item and then click the AddAddAdd IngredientAdd Ingredient to List button to add the ingredient to the menu item cost summary. If you would like to edit an ingredient already entered, select it from the list at the bottom of the calculator, make the changes to your entries, and click the SaveSaveSave ChangesSave Changes button. To delete an entered ingredient, select the ingredient from the list at the bottom of the calculator and click the DelDeleteDeleteDelete button. To clear the form only affecting any saved ingredients, click the CCClearClear Form button. For each menu item ingredient, click the Add Ingredient Row button and complete the applicable entry fields. To remove an ingredient, click the "X" button in the left-hand column. Enter a short description of the ingredient you are calculating the portion cost for. The description may be any length, but longer descriptions will distort the summary report. Enter the lowest known lot cost of the ingredient. This is usually the cost per case, but may also be the cost per gallon, tray (bread), pound, etc. The restaurant food cost calculator calculates cost breakdowns from left to right and stops wherever you do -- using the last calculated cost as the serving-size unit (piece). Enter the quantity you want the lot cost divided by. The cost per unit will be calculated and displayed in Column #4. This is the lot cost (column #2) divided by the number of units (column #3). If a cost is calculated in the previous column (unit cost), enter the quantity you want that cost divided by. The cost per part will be calculated and displayed in Column #6. This is the unit cost (column #4) divided by the number of parts (column #5). If a cost is calculated in the previous column (part cost), enter the quantity you want that cost divided by. The cost per piece will be calculated and displayed in Column #8. This is the part cost (column #6) divided by the number of pieces (column #7). Enter the serving size based on the right-most calculated cost. The restaurant food cost calculator uses the last calculated cost as the amount to calculate the portion cost. If you want to designate a unit of measurement for the serving size, enter a dash after the size number, followed by the measurement description for the number of pieces in the serving size (4-oz, 2-each, 3-slices, etc). This is the last calculated cost multiplied by the serving size. This is the total of portion cost of all entered ingredients. This is the percentage of the menu price the food cost represents. This is the price you would need to charge to achieve your target food cost percentage for this item (if entered). Enter a description of the ingredient you are calculating the portion cost for. The description may be any length, but longer descriptions will distort the summary report. Note that the description will be truncated to 4 letters for labelling the radio buttons, but will maintain its full length for the printer-friendly report. Enter the lowest known lot cost of the ingredient. This is usually the cost per case, but may also be cost per: gallon, tray (bread), pound, etc. The restaurant food cost calculator calculates cost breakdowns from top to bottom and stops wherever you do -- using the last calculated cost as the serving-size unit (piece). Enter the quantity you want the lot cost divided by. The cost per unit will be calculated and displayed to the right of the unit quantity entered. If a cost is calculated in the previous row (part cost), enter the quantity you want that cost divided by. The cost per part will be calculated and displayed to the right of the parts-per-unit quantity entered. If a cost is calculated in the previous row (part cost), enter the quantity you want that cost divided by. The cost per piece will be calculated and displayed to the right of pieces-per-part quantity entered. Enter the serving size based on the bottom-most calculated cost. 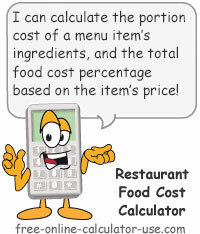 The restaurant food cost calculator uses the last calculated cost as the amount to calculate the portion cost. In the field to the right of the serving size, enter the measurement description for the number of pieces in the serving size, such as oz, each, slices, etc. This is the last calculated cost multiplied by the serving size. Note that you can enter an amount in this row without making any entries in the previous rows and it will be included in the food cost calculation. Enter the name of the menu item and the menu price (both are optional). For each menu item ingredient, enter the description and the lowest known lot cost (case, carton, tray, gallon, or whatever lot is priced on the purchase invoice). Next, from top to bottom, continue to enter quantities until the price gets broken down to the most basic component used in setting the serving size. Then enter the serving size of the ingredient. Once you are satisfied with an ingredient's entries, click the "Add" button to add the ingredient to the menu item summary. Note that you can edit or delete any entered ingredient by selecting it from the list and clicking the appropriate button. For each menu item ingredient, tap/click the "Add Ingredient Row" button and enter the description and the lowest known lot cost (case, carton, tray, gallon, or whatever lot is priced on the purchase invoice). Next, from left to right, continue to enter quantities until the price gets broken down to the most basic component used in setting the serving size. Then enter the ingredient's serving size. Once you have added all of a menu item's ingredients you can click the "Printer Friendly Report" button to open the summary in a report for printing. This is the sum of all of the portion costs entered into the calculator. If you entered a menu price in the top section of the restaurant food cost calculator, this is the percentage of the price that is represented by the cost of the ingredients. How to calculate food costs. Having owned a restaurant myself, I have a keen understanding of how important food and beverage cost control is when it comes to generating restaurant profits. In fact, during the 6-years I owned my own restaurant I used a food cost spreadsheet similar to the restaurant food cost calculator as a means of pricing my menu to achieve my food cost percentage goals. In case you're not familiar with the manual method for determining food cost percentage, let's first take a look at the formula. To calculate the food cost percentage of an individual portion or menu item, you simply add up the cost of the ingredient(s) and divide that result by the menu price. Here's an example of the food cost percentage formula in action. Of course, your target food cost percentage will depend on what type of restaurant you own and what your overhead and variable costs are. In my case I tried to keep my breakfast food costs below 23%, my lunch food costs under 28%, and my supper food costs below 38%.